Youth Adult Pair Go drew 60 players to the Youth Room at the Go Congress this year. Attendance was definitely aided by allowing Rengo pairs (same gender), and several father and child teams were able to compete together. 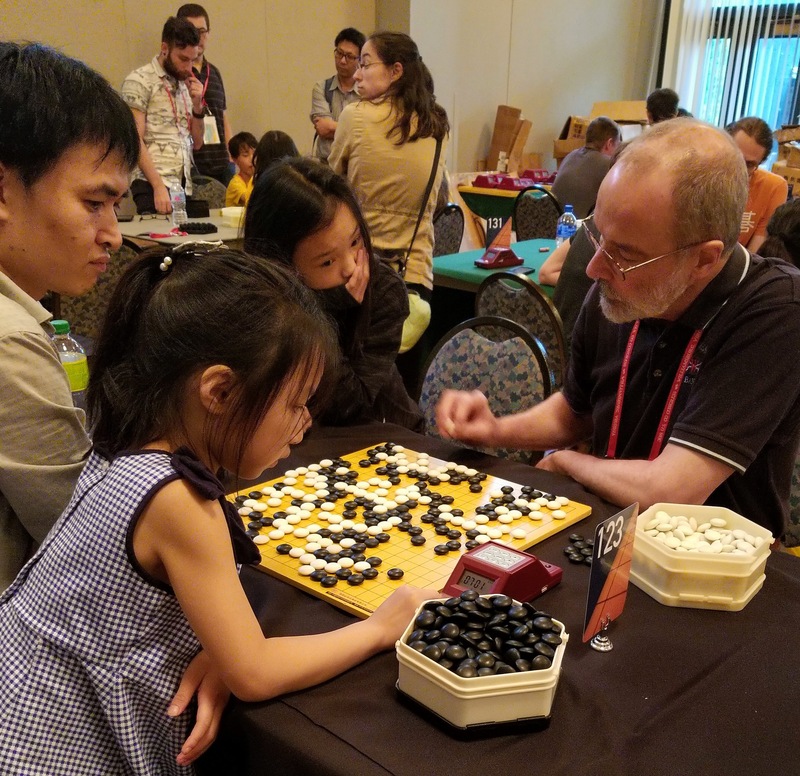 Popular teacher Yuan Zhou 7d and his 8 year old son Derek, 19k, were a team; Bo Qiu 4d played with his son Yizu 9k; Robert and Henry Lyman, 24 and 15k respectively; Jin and Davi Chen, both 5d, rounded out the father and son pairs. Father daughter pairs also participated, and included Andreas and Maya Boerner, 6k and 11k, as well as Yuzhe and Zoey Zhang, 6d and 20k. At the top table Rengo Pair Aaron Ye and Muzhen Ai, both 7d, last year’s Redmond Cup rivals took first place, while Albert Yang 7d and Yifan Zhang 5d took second. Other table winners were Jin and Davi Chen, Soren Jaffe and Fred Bao (both 4d), Becci Torrey 2d and Sophia Wang 3k, Allan Abramson 2d and Victoria Xie 9k, Yuzhe and Zoey Zhang, Tonya Perez Lopez 20k and Nhat Minh Vo 5d, and Robert and Henry Lyman. Other events in the Youth Room included 9×9 and 13×13 tourneys on Monday. table winners in the 9×9 were Tianyuan Zhang 5d and Davi Chen 5d; the 13×13 was won by Duy Minh 5d. - Paul Barchilon, EJ Youth Editor. Photo: Table winners Zoey and Yuzhe Zhang face off against Samantha Soo 15k and James Bonomo 1k.